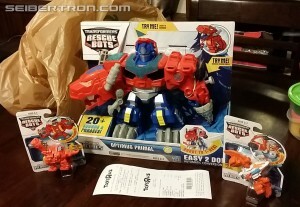 The big man himself Seibertron stopped by his local Toys "R" Us this evening in Schaumburg, Illinois, and was pleasantly surprised to find the new Rescue Bots "Roar and Rescue" Optimus Primal, Heatwave, and Blades figures! These three characters, based on the same characters from the popular Transformers: Rescue Bots cartoon, are dinosaur-themed, with Optimus Prime Primal taking a surprise twist and transforming into a mechanical Tyrannosaurus rex (with a robot mode not unlike Beast Wars Megatron! 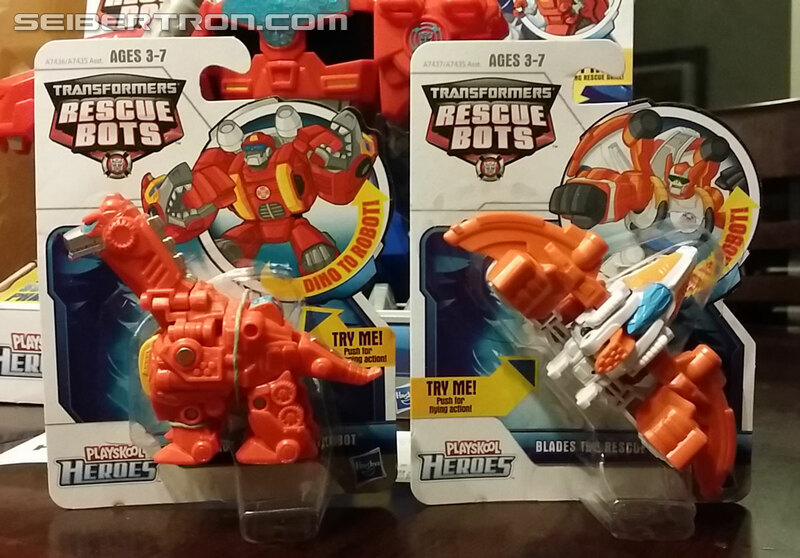 ), Heatwave transforming into an Apatosaurus, and Blades into a Pteranodon. Check out the visual evidence below, then, if you're into these guys, begin the hunt! THIRTY-FOUR DAHHHLARS. Cripes. That's an expensive two-step children's toy. I was considering getting it for the novelty, but sheeeeeesh. I bought Heatwave and Blades yesterday; they are great little figs for the price point. 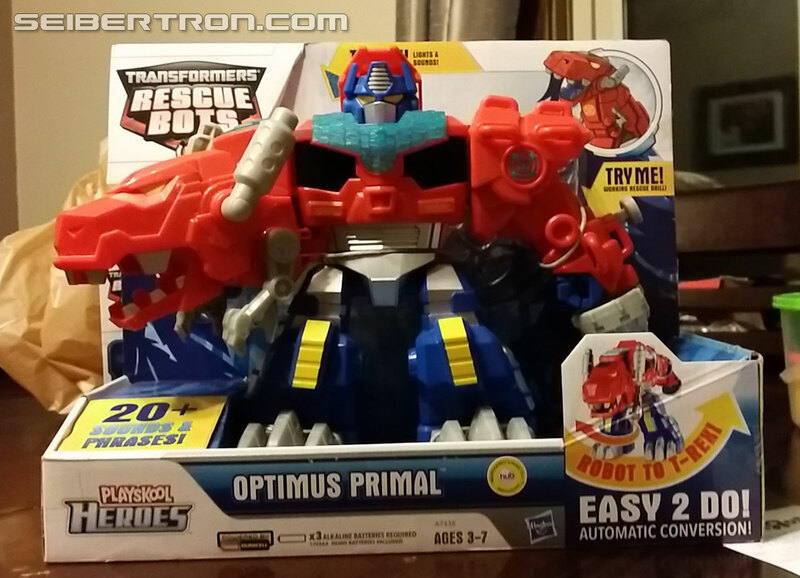 Primal, I will wait on a bit until i see a good sale on him; although he does look pretty awesome. Is this the full dino lineup? gothsaurus wrote: Is this the full dino lineup? Nope, this is the most up to date listing of them all I have access to right now. *You might have to cut and paste the link, the board is not accepting the complete URL for some reason. Thanks! Looks like you're looking at six dinos if you want the whole team. 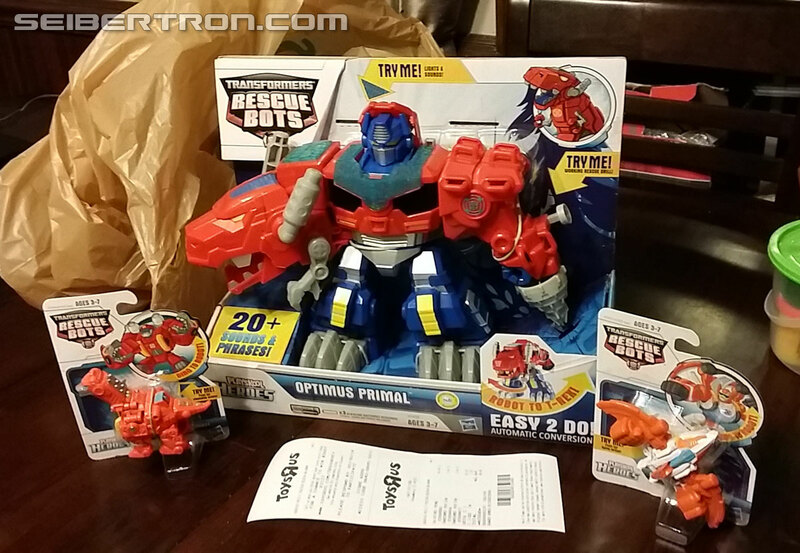 A while back we reported some initial Transformers Rescue Bots figures showing up at US retail. 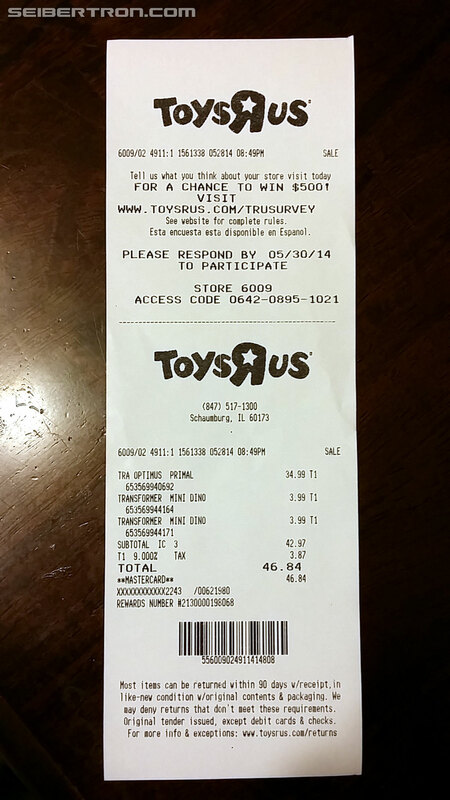 Thanks to Seibertron.com member zatara1701, we can now report new sighting of new figures from the same line, from a Toys'R'Us store in Humble, Texas! Check out below the two (adorable) dino versions of a T-Rex Optimus Prime and a Raptor Bumblebee, along with some out-of-package images and comparison shots. 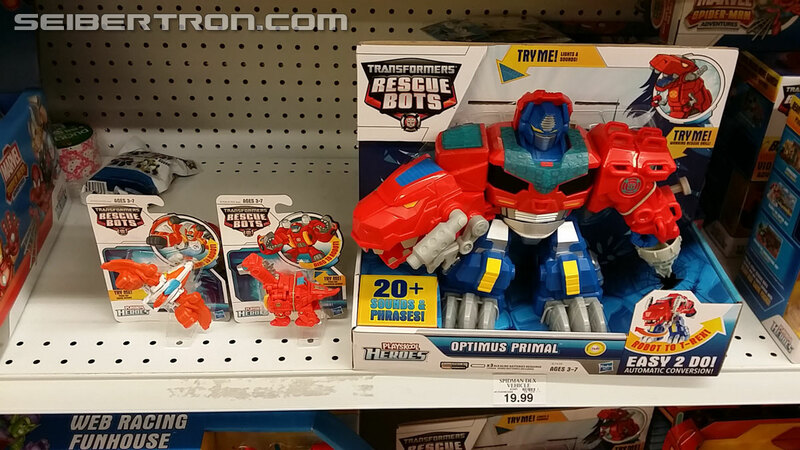 While out toy hunting at a Target in Rosemont, Il, site owner Seibertron spotted some new Transformers Rescue Bots on the toy aisle. The figures spotted were Bumblebee & Morbot and Blades The Flight-Bot & Dani Burns. The first three images were the initial sighting image but in true Seibertron fashion, we get treated to a mini gallery of these figures. Morbot's a tad smaller than it should be, though he didn't shrink as bad as Trex. But on the plus side, we get Dani, a jettish Blades, and a Bee with 2 hands instead of that screwdriver! Well, I'm finally going to army-build with preschool toys. I knew this day would come, just not when. I could care less about the Mor-Bot, but Dani shall be mine! The Sculpt could be better on Dani, but a miniature Lacey Chabert is rather compelling. rpetras wrote: The Sculpt could be better on Dani, but a miniature Lacey Chabert is rather compelling. It's the cheeks, isn't it? I'm gonna just go ahead and be glad we're getting a Dani at all. Already have the other Burnses, so hopefully I'll get a chance to buy her too at some point and have the whole family. Mini Mor-bot looks okay, but seems less necessary. 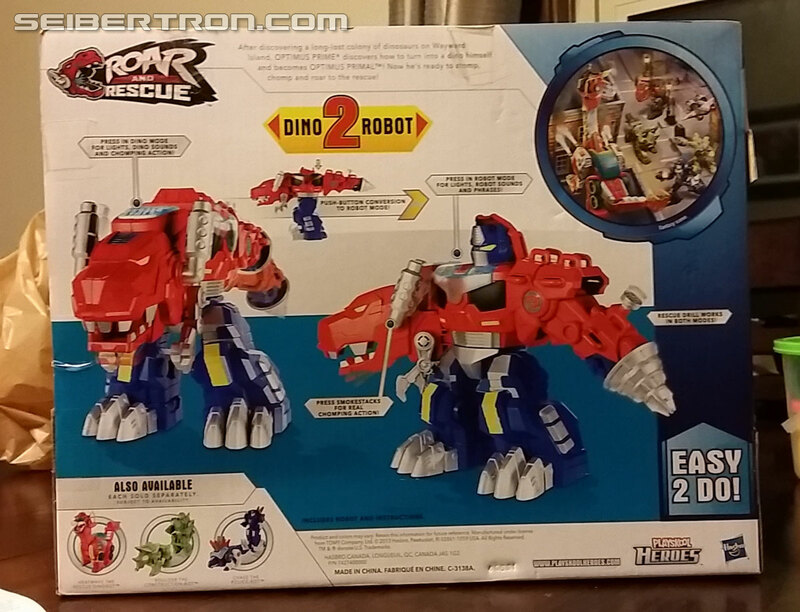 Last we saw news about PlaySkool Transformers Rescue Bots Dinobots, the green- and blueosaur were still missing. But thanks to fellow Seibertron.com user Superwheeljack, we have a sighting from a Target in Cincinnati, Ohio, of both minibots Boluder and Chase ($3.99 each)! Check out photo proof below, and if you come across any new figures, make sure to use the right Sightings page, flag it up in a forum, and let us know at sightings@seibertron.com. These have been here in Orlando for about 3-4 weeks. Didn't realize it was a new story. I tend to get things way behind everyone else. I liked these guys, but Boulder and Chase aren't as good or fun as Blades and Heatwave. This is news? I bought my children these a MONTH ago. Yep, been out for a month in my area (PA) too. If you see new stuff and you aren't sure if others know it's out, shoot it over to news@seibertron.com or sightings@seibertron.com - the worst that happens is it isn't news and doesn't get posted! These little dudes are so fun. 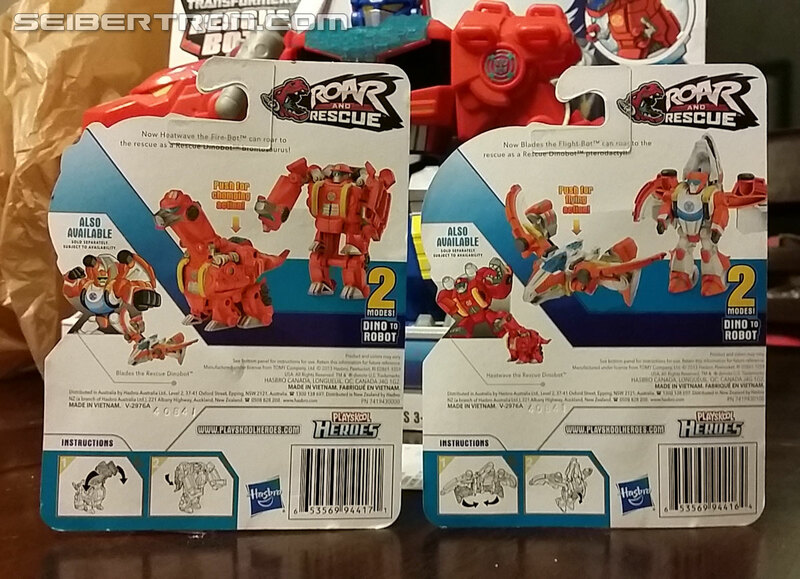 I was totally ready to be done with Rescue Bots forever, but these are just too cute. Plus, now Chase can drive himself. For all of you who claim you got these, at least provide proof. I didn't pick these guys up, I was just there to pick up a deluxe Scorn for spare parts. I can't stand how small they are next to prime and bee. They have so little detail thanks to their size. I found these lil guys like a month ago too...I didnt bother submitting it as news cuz after I was front paged for finding BB and OP there was not one post/reply....Soooo i figured why wast time uploading and taking pics?!? I am pretty sure the whole new playskool line is available on HTS and TRU websites. Superwheeljack wrote: For all of you who claim you got these, at least provide proof. Why should we do that? I have nothing to prove to anyone as I don't care if you believe me or not. Furthermore, are you going to pay me for my time and effort if I scout toys? If not, then I do not owe you or anyone else on this site anything. They are making money off of me being here in the first place in the form of advertising revenue. Do you think all those ads to the right are there for free? If you like to collect "prestige" points for being the first fanboy to take pictures of toys in a big box store, then by all means go for it. 3,363 pages were recently viewed by 599 unique visitors. This page was viewed 1 times on Friday, April 19th 2019 5:16am CDT. © 2019 Seibertron, Inc. DBA Seibertron.com. All Rights Reserved. Established June 2000. Seibertron.com is owned by Ryan Yzquierdo.